Argos Solutions, a leading digital solutions provider to the digital printing industry, headquartered in Edingen, Belgium, with operations in Riviera Beach, Florida, designs, develops and delivers high-end flat-and spot-coaters, web cleaners and consumables for the global commercial, document, label and packaging market segments. The inline coating development is based on the Argos pioneering products and services from the last years. Mr. Michiels continues. “I am also delighted to welcome the Plockmatic Group into this unique world of coating on digital printed documents and look forward to supporting them and building on their continued success in document finishing history.” The corporation between the two companies is a logic fit, Plockmatic has all the knowledge, technologies, streamlined production and relations to the major printer manufacturers, one of the products missing in their whole offering is…coating. 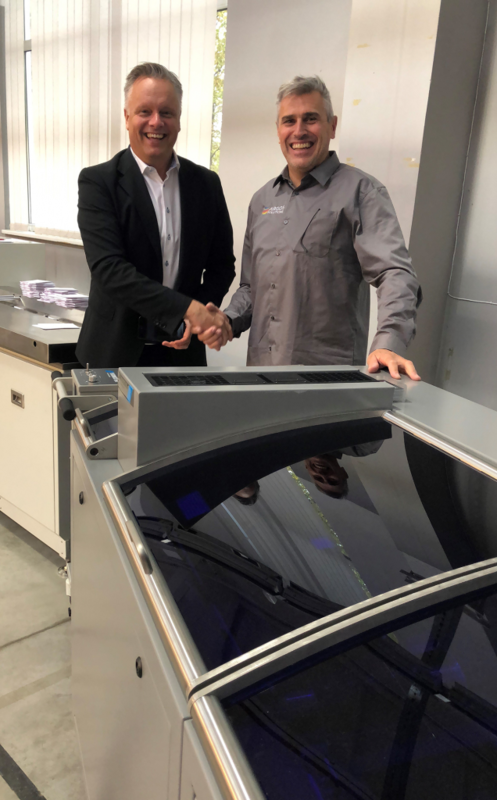 “Within Plockmatic Group strategy, coating is one of the most requested options within sheet enhancement for digital printed media, both toner and inkjet printing technologies” Says Tommy Segelberg, Director Technology Alliances within the Plockmatic Group.